Admission open to AMU off campus centers at Murshidabad (WB) and at Malappuram (Kerala). Click here for admission form. Mumbai: US President Barack Obama will retrace the footsteps of his "real hero" Mahatma Gandhi when he walks through the Mani Bhavan Gandhi Sangrahalaya, which was the Mumbai home of the apostle of ahimsa from 1917 and 1934 and is now a museum housing rare memorabilia and 50,000 books. The two-storey building on Laburnum Road, which Obama will visit during his two-day trip to Mumbai Nov 6, was also the peaceful abode for the US president's other inspiration, Martin Luther King, and his wife Coretta King for two days in May 1959. "Living at Mani Bhavan for these few days has been almost like living with Gandhiji. Thank you for providing me with the very rich and inspiring experience," Coretta King has written in the visitor's book. It was here that Gandhi initiated the non-cooperation, satyagraha, swadeshi and khilafat movements, the authorities said. All set to welcome Obama, Mani Bhavan will greet the president and his wife Michelle with garlands of khadi and coconut water as is the tradition of the place, an official said here. Bhavan president Vasant Pradhan will greet Obama while Gandhi's granddaughter Usha Gokani will welcome the first lady. It has got a fresh coat of paint and the premises have been spruced up, but the authorities said not many changes could be made as it was a heritage site. "With the place converted into a library and museum, there isn't any scope of making physical changes. We would not want to change the spots where Gandhiji spun the 'charkha' or held meetings with fellow freedom fighters," Mani Bhavan executive secretary Meghshyam Ajgaonkar said. Ajgaonkar, who said he has learnt patience from the Mahatma even though he never met him, disclosed that security officials from the US Consulate had been regularly visiting the premises. "But the details of the security checks remain unavailable to us. We have been told not to worry about the security. The Consulate will be taking care of that bit," said the 63-year-old. "But we are keeping it closed for general public from Nov 5-7," added Ajgaonkar, who believes that his four-decade stint with the Bhavan is not a career but a mission. About 300 people visit the library and the museum everyday, the number going up during holidays. The Bhavan, converted into a museum and a library with 50,000 books and periodicals, several of them on and by Gandhi, has also preserved his spinning wheel and other belongings. The building was owned by Gandhi's friend and follower Revashankar Jagjeevan Jhaveri. In 1955, the building was taken over by the Gandhi Smarak Nidhi and later became a heritage building. Gandhi, Obama was reported as saying last year, was a "real hero". "He (Mahatma Gandhi) is somebody whom I find a lot of inspiration in. He inspired Dr King (Martin Luther), so if it hadn't been for the non-violent movement in India, you might not have seen the same non-violent movement for civil rights here in the United States," Obama had told school students. "In my life, I have always looked to Mahatma Gandhi as an inspiration because he embodies the kind of transformational change that can be made when ordinary people come together to do extraordinary things," he wrote in a newspaper before becoming president. "That is why his portrait hangs in my Senate office; to remind me that real results will not just come from Washington, they will come from the people." Obama, who is in India from Nov 6-9, has another tryst with his idol when he visits Rajghat, Gandhi's memorial in New Delhi. 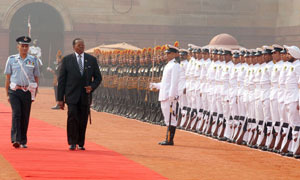 President of Republic of Malawi Ngwazi Prof. Bingu wa Mutharika inspecting the Guard of Honour, at the ceremonial reception, at Rashtrapati Bhawan, in New Delhi on November 03, 2010.